On Thursday the 4th of June, people from Cameroon, the Ivory Coast and activists from the Conféderation Paysanne, will disrupt the AGM of the Bolloré group in Puteaux, outside Paris. Local communities deprived of their land by the industrial palm oil plantations belonging to the Socfin group, in which the Bolloré group is heavily involved, have mobilised since April in Cameroon, Cambodia, Ivory Coast and the Liberia to get back the land that belongs to them. « They take our land, our turn to take theirs! ». This Thursday the 4th of June, several dozens of people will support the call of the local communities deprived of their land by the industrial plantations connected to the activities of the Bolloré group. Armed with shovels and pitchforks, they will invite themselves to Bolloré’s AGM, which takes place at 4pm at 31-32 quai de Dion Bouton in Puteaux. 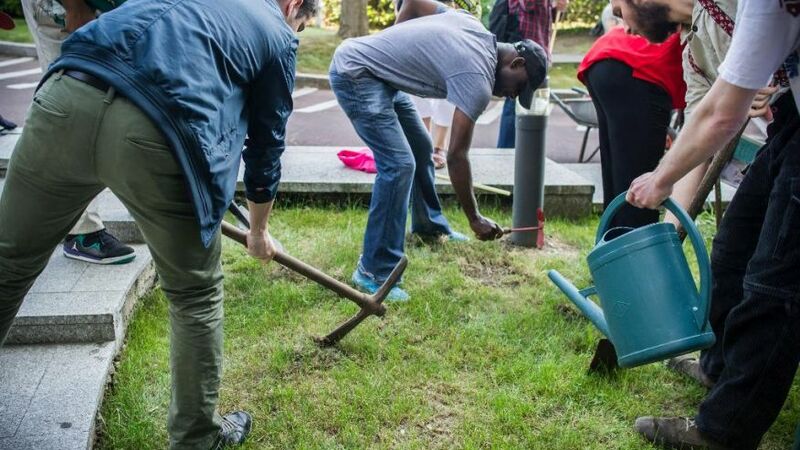 People from Cameroon and the Ivory Coast supported by the Confédération paysanne and several French NGOS (Sherpa, Peuples Solidaires, CCFD, Grain, Agter) will deliver this message : « We do not have any land left in our countries, we come today to sow the cassava on your lawn, Mr Bolloré! » This action is part of the wider global resistance movement launched at the end of April by the International Alliance of Local Communities of the Socfin Bolloré plantations ; they blockaded plantations in Cameroon between the 23rd and the 28th of April, blockades which were then followed by protests in Liberia, Cambodia and in the Ivory Coast. Everywhere, local communities have the same demands: that the Socfin give back to local communities the right to land vital to the villages and the compensations promised in the agreements signed with them (see attached the current situation and demands) .